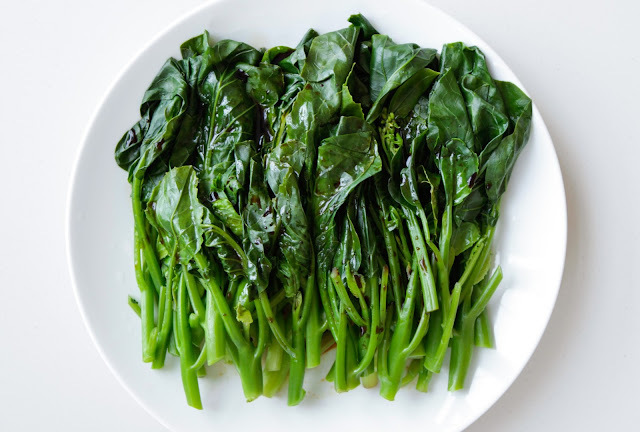 Chinese broccoli also known as Gai Lan or Kai Lan, is a nutritious Asian green that belongs to the same family as broccoli (brassica oleracea). Broccolini is actually a cross between Chinese broccoli and broccoli which is why it looks like a leafier version of broccolini. It has a similar taste to broccoli and when served with a sauce the leaves really absorb the flavours. My 12 year old and I could easily do a plate each of this Chinese Broccoli with Tamari and Sesame oil! I sometimes just have a plate of this for dinner as it’s soo tasty! Chinese broccoli is a nutrient dense vegetable, having a large surface area with the leaves I would try and source organic whenever possible. It contains folate, vitamins (A, C & K) and high in fibre. It also is a source of iron and calcium. Dark leafy greens are also very alkalising for the body (most diseases start when our bodies are in an acidic state). This recipe is quick and simple making it an easy side to any meal. I use a wheat free tamari sauce, you can also use coconut aminos or liquid aminos to give the ‘soy’ taste.